Samsara in Buddhist and Hindu philosophy means the wheel of life, the cycle of birth, growth, decay, death and rebirth. 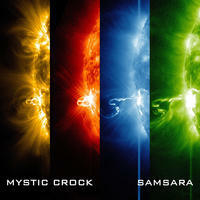 Samsara has inspired Mystic Crock to make his 5th studio album. He processed his own experiences during the production period. Cheerful, enthusiastic moods alternate with darkness and sadness, bringing hope to find a new, fulfilling sense of self. Mystic Crock plunged deep into the essence of meditation and yoga and contemplated psychedelic connections of our universe. Each song follows the path of Samsara, from birth - to life - to the end. Five by Stargarden: huge ambient compositions.